Cultural Model Runway is a style feature focusing on black models represented at various international Fashion Week events. 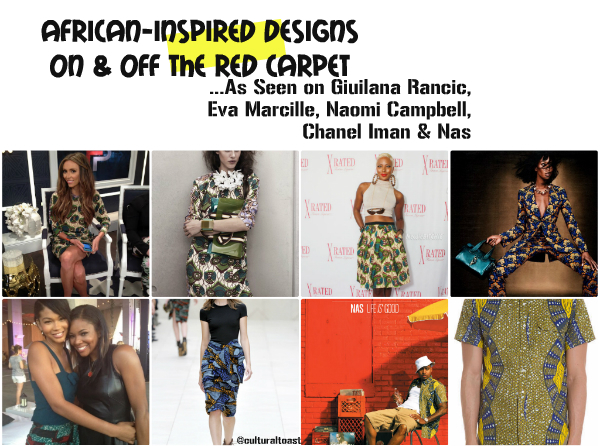 As I posted up on Tumblr (culturaltoast.tumblr.com) recently Eva Marcille, Chanel Iman, Naomi Campbell, and Nas were photographed rocking hip African-inspired designs on and off the red carpet. So much inspiration can be drawn upon how these celebrities wore their African-inspired fashion looks. Eva Marcille attended LaLa Anthony’s birthday brunch in a Marni for H&M printed A-line skirt. If you can recall I did a post on this hot designer-collaboration for H&M much earlier. I love how Eva put her signature style funk on the skirt from the accessories to the make-up! Not to be outdone but E! News reporter & Fashion Police correspondent Giuliana Ranic also wore a piece from Marni for H&M recently. As you can see Giuliana didn’t add much to the dress so it can be her statement piece. Which of the two Marni for H&M looks did you prefer – Eva or Giuliana? 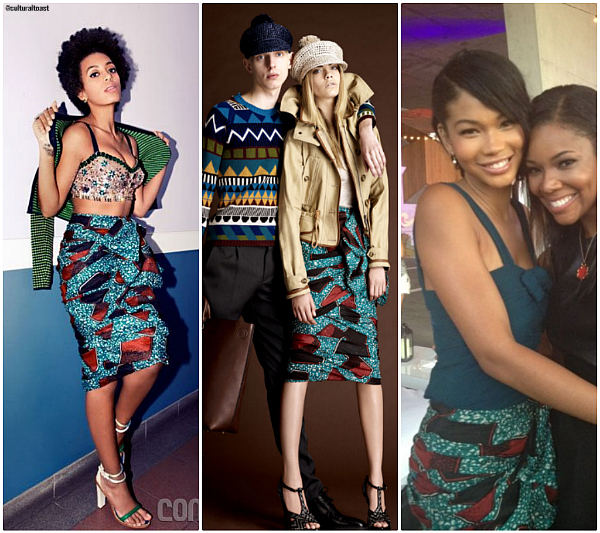 Chanel Iman (with Gabrielle Union) was seen in a high-waisted Burberry Prosrum skirt. 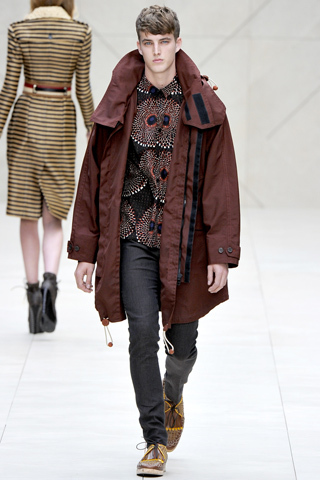 Revisit my post on Burberry Prorsum’s African-inspired collection here. Solange Knowles also embraces wax print fashion as she did in her April 2012 Complex magazine photo shoot. Both looks are taken from Burberry Prorsum Resort 2012 collection. 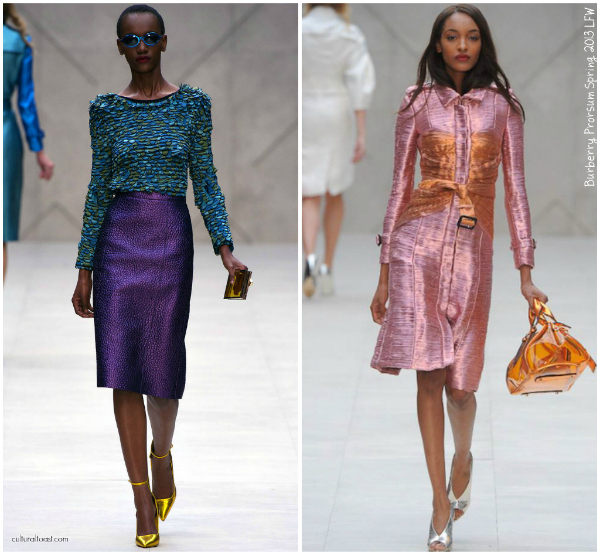 Which Burberry Prorsum Resort 2012 look do you prefer – Solange or Chanel? For her W Magazine July 2012 photo session, Naomi Campbell was seen in a African-inspired suit! 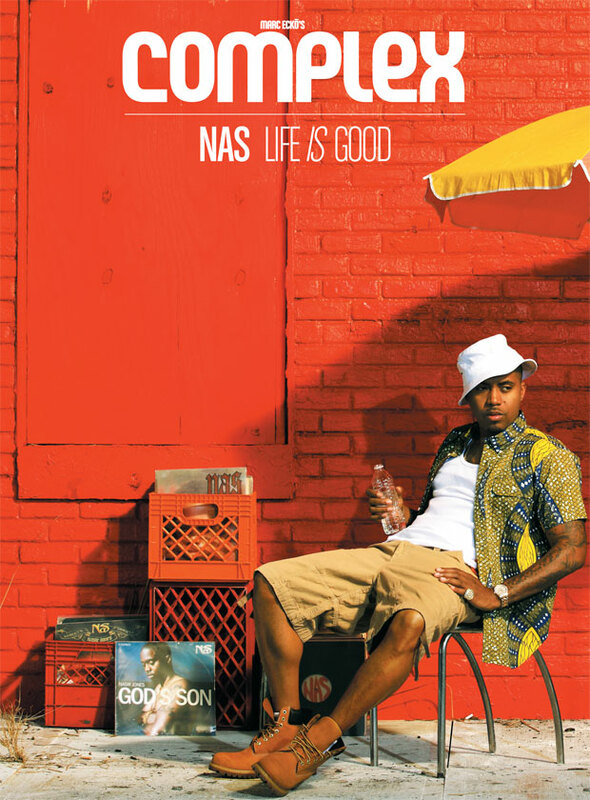 Nas wore a hip African-inspired ankara shirt by Woolrich Woolen Mills on the June/July 2012 cover of Complex magazine. The shirt is taken from the Summer 2012 collection which you can purchase here! Props to June Ambrose for hooking up Nas with some tasteful Africani-inspired fashion. 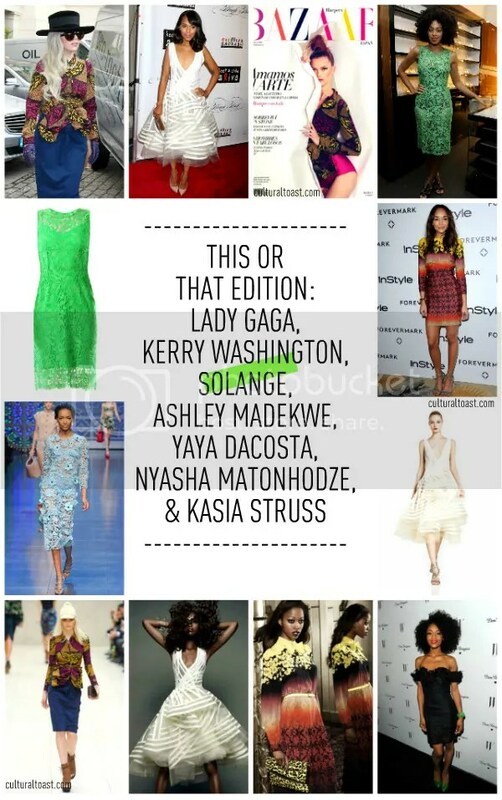 Cultural Presence looks at how celebrities and everyday people wear African fashion straight from the runway. Good Morning America anchor Robin Roberts was spotted outside ABC Studios in Times Square wearing a Burberry Prorsum Spring/Summer 2012 wax print cashmere scarf. According to Burberry.com, Robin’s scarf retails for -drumrolls please- $1,095.00. 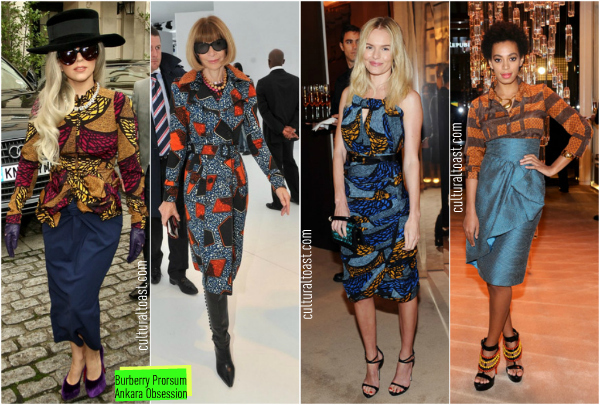 It comes as no surprise that CulturalToast.com embraces African wax print fashion. I absolutely love it! If you’re following CulturalToast.com’s Tumblr page, there’s plenty more African wax print looks to drool over. The print of Robin’s scarf is very similar to a dress actress Kate Bosworth wore this past October. Robin’s scarf as you can see is a variation of a skirt seen on the runway during London Fashion Week Spring 2012 and the print was also used as dress as seen on Kate Bosworth. Burberry’s online boutique has a handful of scarves similar to Robin’s which can check out here. I’m definitely loving that appreciation for wax print fashion. This or That Edition on CulturalToast.com examines style trends on and off the red carpet. Sometimes it’s a fashion face-off or two looks that’s quite similar. There’s plenty of great features such as this and much more published daily on the Tumblr page. This or That has quickly become a hot commodity on CulturalToast.com. Join us in discovering a few fashionable style shows we couldn’t resist sharing with our readers. Origami, ankara, lace and ombre all made it into our latest This or That edition. 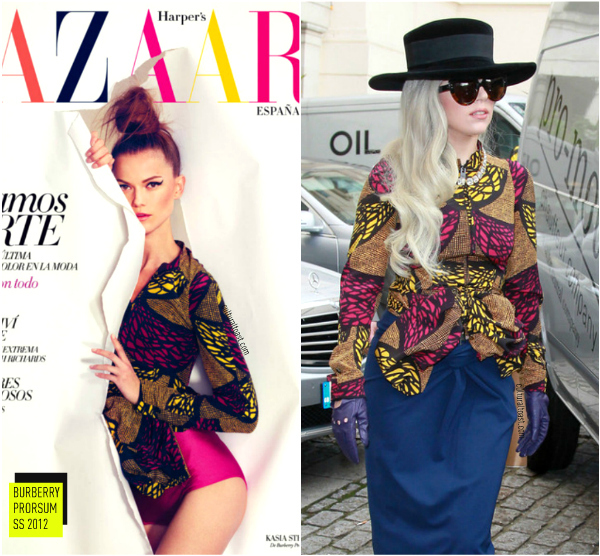 First up, there’s THE coveted Burberry Prorsum SS 2012 ankara jacket that appeared on the February 2012 cover of Harper’s Bazaar Spain featuring Kasia Struss and was also seen on Lady Gaga. This ankara print jacket first made its runway appearance during London Fashion Week before it was later seen on Lady Gaga. 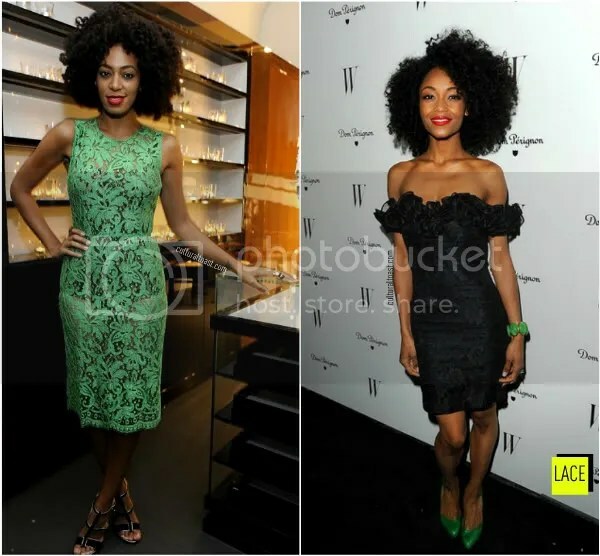 Actress YaYa DaCosta and Solange Knowles are into this season’s trend of the moment – lace. 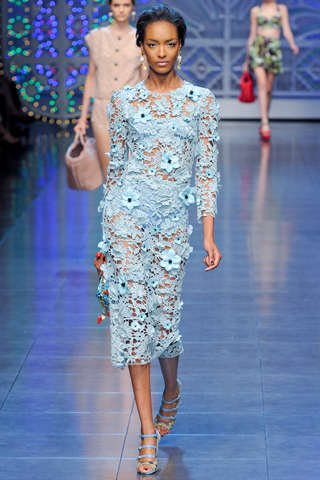 Don’t you love Solange’s green lace Dolce & Gabbana Aso Oke-esqe dress during Milan Fashion Week? YaYa added green accessories to her black off the shoulder lace dress when she attended W Magazine’s 69th Annual Golden Globes award celebration in New York City. Natural curls and bold red lipsticks completed both fashionista’s red carpet looks. 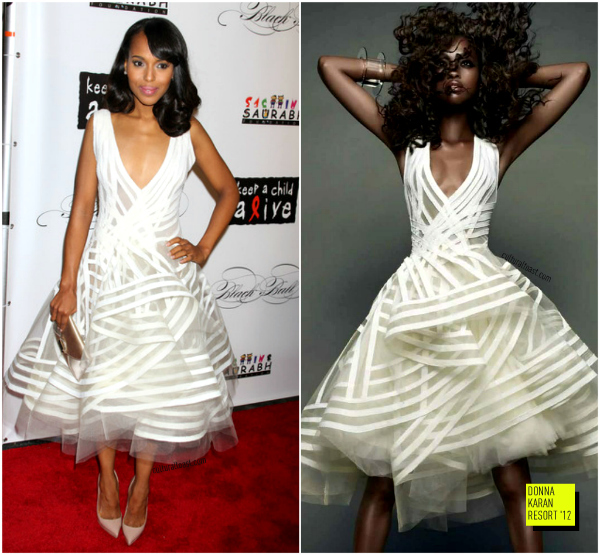 Editorial to real life has never looked glamorous thanks in part to Nyasha Matonhodze and Kerry Washington’s origami white Donna Karan frock. Kerry was seen in this lovely get-up from Donna Karan’s Resort 2011 collection at the 8th Annual Keep A Child Alive Black Ball. Nyasha wore this look for her Vogue Japan November 2011 editorial. Zimbabwe’s it girl and Louis Vuitton’s it model Nyasha Matonhodze wraps up our fun This or That edition thanks to her high-profile Topshop Fall 2011 print AD campaign. 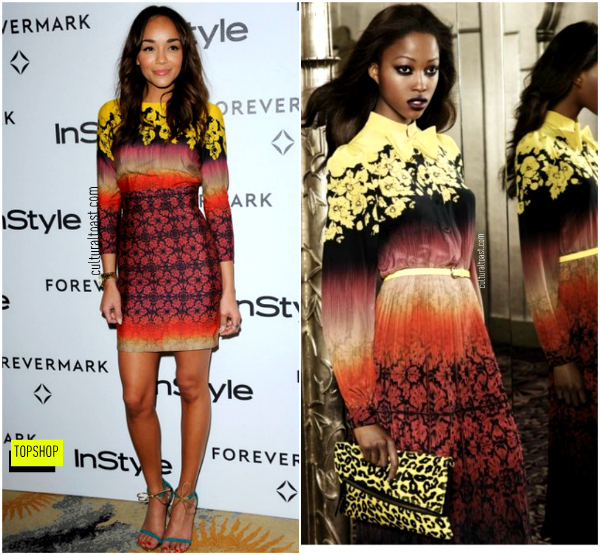 ABC’s Revenge Ashley Madekwe is also a fan of this ombre look when she attended the Forevermark and InStyle Golden Globe event. Has any of these looks inspired your next evening out on the town? getty. pacific coast news. baufer griffin. style. This Or That examines style trends on and off the red carpet. Sometimes it’s a fashion face-off or two looks that’s quite similar. 2011 is over and done with but let’s look back at what a great year in fashion it has been for several notable African-run labels. 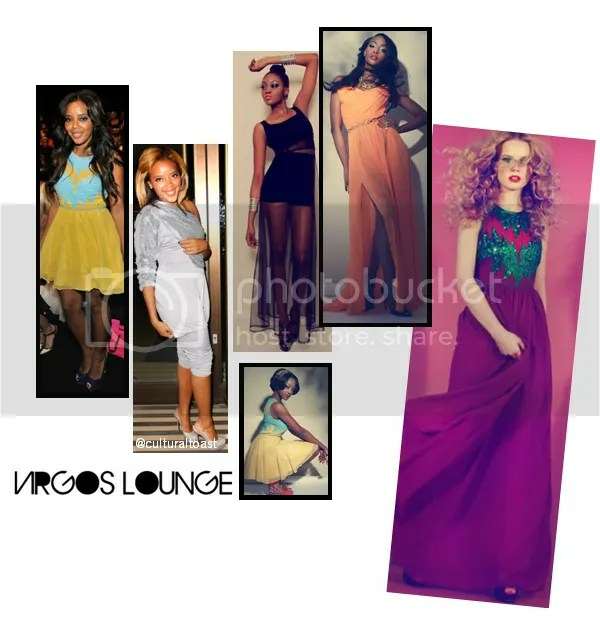 Bridget Awosika, Suno, Jewel By Lisa, Anita Quansah London, Virgos Lounge, Burberry, Bunmi Koko, Mimi Plange, LemLem, Kiki Clothing, Suno and Thakoon ruled the red carpet with classy innovative sleek designs. A winning factor for each designer was of course the loyal support of their high-profile clients. Lisa Folawiyo, creative director and founder of Jewel By Lisa, has solidified her fashion stance. From her well accepted approval at Arise Made in Africa New York Fashion Week presentation to her newly launched diffusion line, The J Label, Lisa’s JBL has proved she’s truly a houshold name in fashion. Her biggest milestone in 2011 came courtesy of E News Correspondent Catt Sadler wearing her designs three times on air. JBL has gone Hollywood! Jewel By Lisa went on to become a red carpet fan favorite as seen on Eku Edewor, Solange Knowles, Kendall Jenner, Genevieve Nnaji, and many more. Currently Lisa has announced plans to release a coffee table book which CulturalToast.com previewed at NYFW SS 2012 and it’s definitely worth the wait! We’re eager to see what Lisa has planned for 2012! 2011 was Anita Quansah London’s year of success! 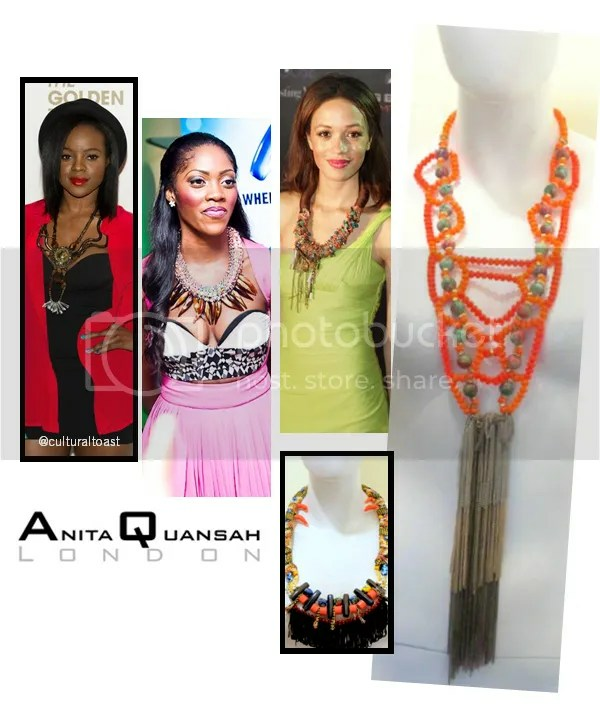 Public admiration for Anita Quansah London’s handcrafted jewelry collection ignited when Keisha Buchanan stepped out in a neckpiece at Naomi Campbell’s Fashion for Relief launch. Nigerian singing sensation Tiwa Savage was obsessed with Anita Quansah London designs whenever she had a red carpet event to attend. Shortly after Anita Quansah London announced her collaboration with fellow Nigerian fashion label Jewel By Lisa for their new diffusion line, The J Label. Currently Anita Quansah London is working on a new diffusion line due to launch soon! 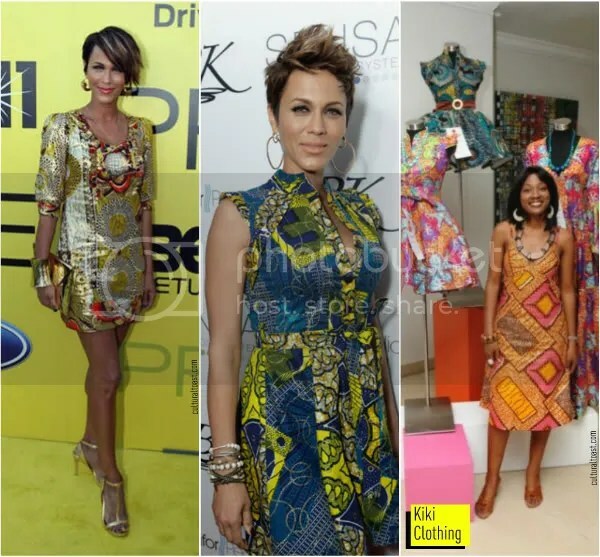 When actress Nicole Ari Parker visited her husband’s paternal home of Ghana, she fell in love with Ghanaian, Nigerian fashion house Kiki Clothing. Nicole wore not one but two dresses from Kiki Clothing to major high-profile red carpet events this past year. Back in October, Kiki Clothing presented their latest collection at Africa Fashion International Week in Cape Town, South Africa. Kiki Clothing’s founder Titi Ademola is sure to bring IT in 2012! 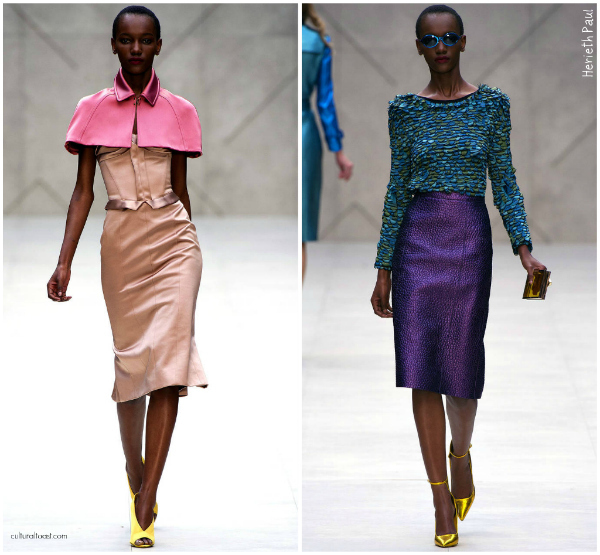 A well deserved recognition from Vogue Italia was just a perfect way to sum up rising Nigerian fashion label Bridget Awosika’s 2011. 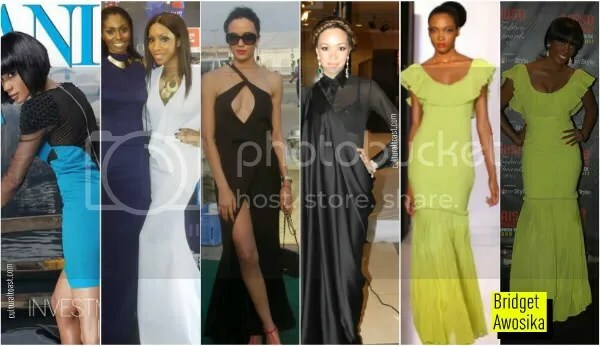 Nigerian TV personality Eku Edewor became Bridget Awosika’s most vocal, loyal supporter. Beloved by top Nigerian red carpet beauty queens like Funmi Iyanda, Tiwa Savage, Eku Edewor, EMLN 2011 winner EMLN 2011 winner Chika Chinwe, Nigerian model Makida Moda, and Adora Oleh. 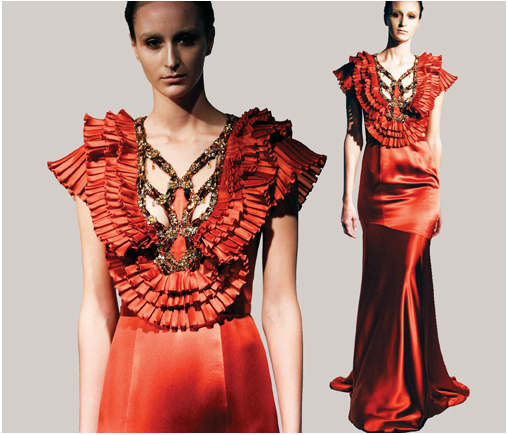 Bridget Awosika has bloosom to a high ranking contemporary womenswear line. 2012 will of course bring the Bridget Awosika name to red carpet fever heights! When Nigerian stylist Kanayo Ebi pick out a silver sequin one-shoulder jumpsuit for her client Angela Simmons, all wanted to know who design it Nigerian, London-based label Virgos Lounge has provided women with contemporary, vintage-inspired designs since its 2008 launch. Currently the label just release their Party Collection featuring their favorite model Omowunmi Gbadamosi. Angela has since bought the glamour of Virgos Lounge to Betsey Johnson’s runway presentation at New York Fashion Week. First Lady Michelle Obama, Esperanza Spalding, Solange Knowles, Heidi Klum and Tai Beauchamp all wore the bold prints from the New York-based fashion label in 2011. Whether it’ll be Tai’s Suno x Loefller Randall canvas printed wedges or Michelle’s s silk pleated skirt, Suno produced classy design that will make every fashion-forward girl splurge a little! Suno currently re-launched their e-commerce site, where fashionistas can either window shop or shop ’til they drop! Two Kardashian sisters (Kim & Khloe), Solange Knowles, First Lady Michelle Obama, and supermodel Iman sworn by Thakoon in 2011. Thakoon also created a limited edition Massai print scarf that sends all proceeds to famine-torn countries within the Horn of Africa – Somalia, Kenya, Ethiopia and Djibouti. 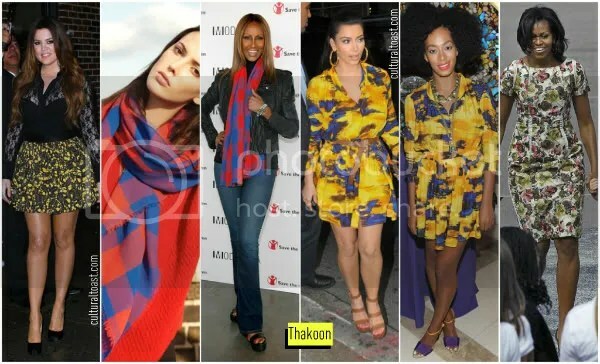 Although Thakoon’s pre-Fall 2012 collection is a slight departure from their print heavy, Kenya-inspired Fall 2011 collection, we’re eager to see what else they have in store for 2012! 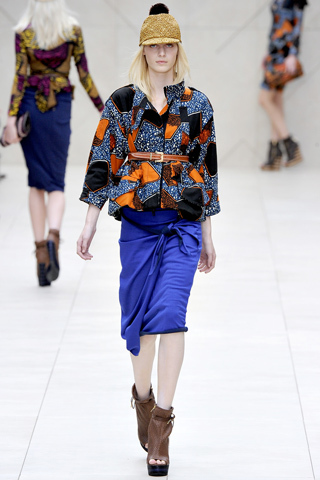 Burberry was definitely inspired by rich African textiles for their 2012’s Resort and Spring collections. Lady Gaga, Anna Wintour, Solange Knowles, Kate Bosworth and Transformers star Rosie Huntington-Whiteley were faithful to Burberry’s prints in 2011. The hoopla on all things African fashion intensified, hasn’t it? 2011 produced Mimi Plange’s biggest accomplishment thanks to her collaboration with Manolo Blahnik which she revealed at her A Flower in the Desert Spring/Summer 2012 presentation during New York Fashion Week in front of her fellow fashion supporters Duro Olowu, Bethann Hardison, Rachel Zoe and Andre Leon Talley. 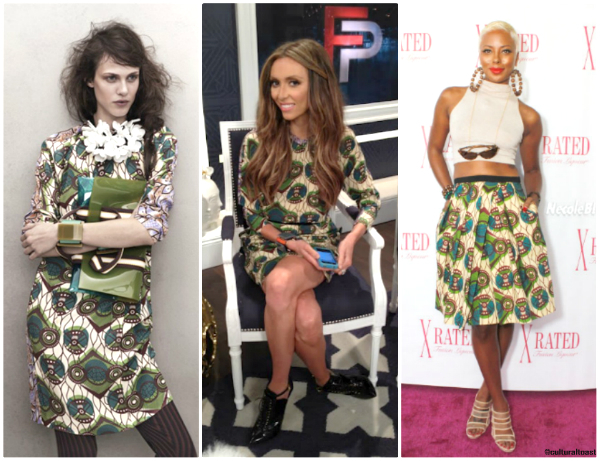 Kat Graham, Vanessa Hudgens, Rihanna, Kristen Cavallari, Mary Birdsong, and Estelle were all seen in Mimi Plange designs. Before Bunmi Koko’s founder Bunmi Olaye stepped down as the lead designer from her label, she provided classy eccentric designs as seen on Omotola, Melanie Brown, Michelle Williams, and Keisha Buchanan in 2011. (FYI: Omotola was the first to wear the lime pleated dress from Bunmi Koko’s Spring/Summer 2012 Allure of The Sirens collection. Currently Bunmi Koko presented a revamped website or a droolworthy e-commerce site. As for any explanation why Bunmi departed her label, she only had the following to offer: I have not giving up on my dream, however the time has come for me to pursue a vision that is entirely my own. LemLem ‘s founder Liya Kebede put her supermodel skills to the test in 2011 when she stepped out on numerous occasions wearing her Ethiopia-based womenswear line. We fell in love with Liya’s handkerchief-styled handwoven tunic when she attended the Tribute to the Models of Versailles 1973 at MET back in January. Who could resist her scarf, too? Liya continued to be her label’s best spokesmodel when she wore Lem Lem to two high-profile New York City film screenings. 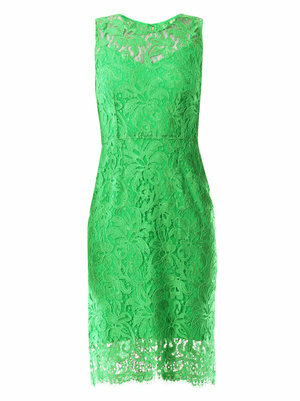 Currently LemLem has launched a Tumblr and of course a hip new Resort 2012 collection. Liya started LemLem in 2007 “inspire economic independence in her native country and to preserve the art of weaving.” We’re eager to see what else Lem Lem has to offer! 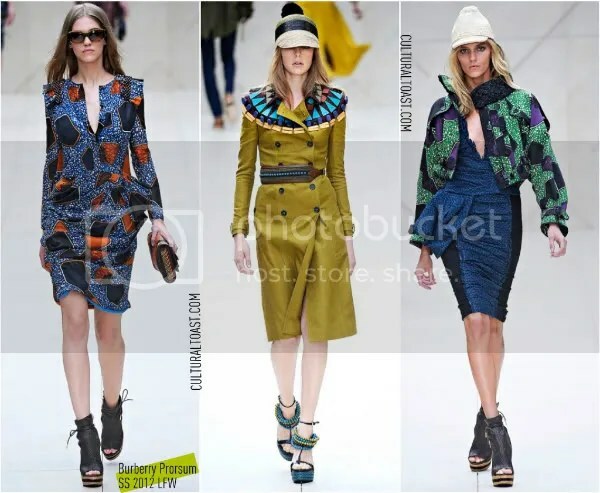 Wrapping up the very best moments in African fashion were Gwen Stefani’s L.A.M.B collection, Chayla’s Deola Sagoe stunner at New York Fashion Week, Eku Edewor’s Republic of Foreigner embellished top, Teyana Taylor’s Vibe Vixen African-inspired shoot, Jackie Appiah’s Jil F.A.C.E. List Awards dress, Genevieve Nnaji showing loyalty to Zed Eye & Jewel by Lisa time and time again, and Gregory Parkinson’s African-inspired totes. 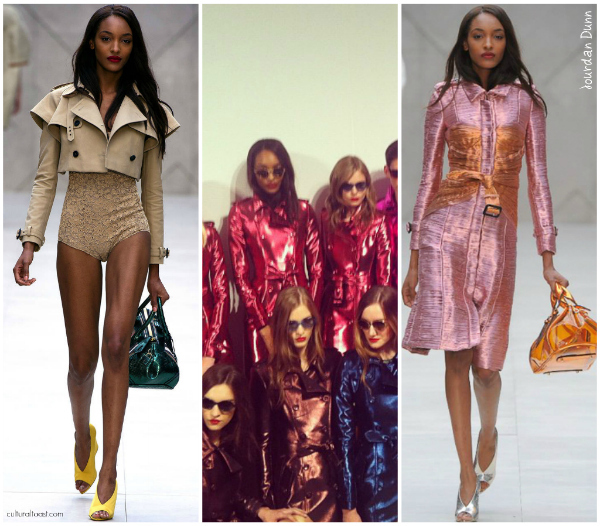 These designer labels are THE ones to watch in 2012 as we predict more groundbreaking milestones to come for each one. Out of the 11, which one has you wanting to know what’s their next move in 2012? Cultural Annual Review takes a look back in the previous year in film, fashion, entertainment and much more! Lady Gaga, one of pop music’s biggest superstar, was spotted out and about in a Burberry Prorsum Spring/Summer 2012 Ankara jacket in London. We love her Christian Louboutin Daffodil suede purple heels! CulturalToast.com always appreciates seeing how celebrities put their own personal funk on African fashion fabric straight from the runway. 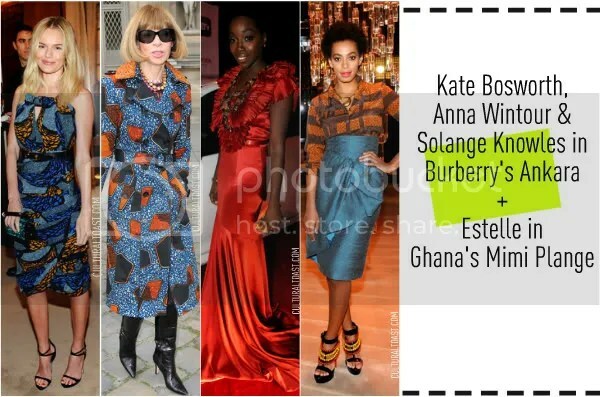 Lady Gaga however is the not the first celebrity to seen wearing an “African-inspired” design from Burberry Prorsum. Gaga joins the ranks of Solange, Kate Bosworth and Anna Wintour who’s obsessed with African fashion fabric-inspired Burberry designs on and off the red carpet. As you can tell Gaga’s jacket print is the same pattern as Kate Bosworth’s dress. Gotta love the globalization of African fashion? CulturalToast.com does NOT think it’s a fad but a lifestyle. 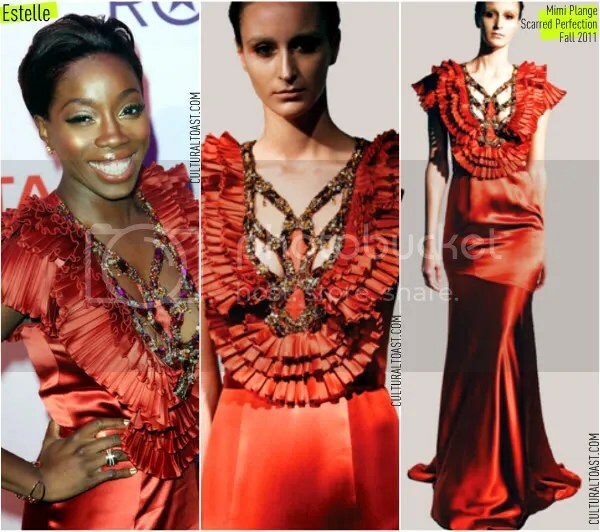 When Estelle stepped out in this fire engine red satin ruffle Mimi Plange dress at the 2011 Black Girls Rock event, a collective round of applause was heard within the African fashion circuit. After all the dress was picked from the very collection that Vogue Editor at Large Andre Leon Talley physically co-signed when it was first unveiled during New York Fashion Week. Mimi Plange’s a fab Ghanaian fashion designer who CulturalToast.com had the pleasure of meeting at her private NYFW show. 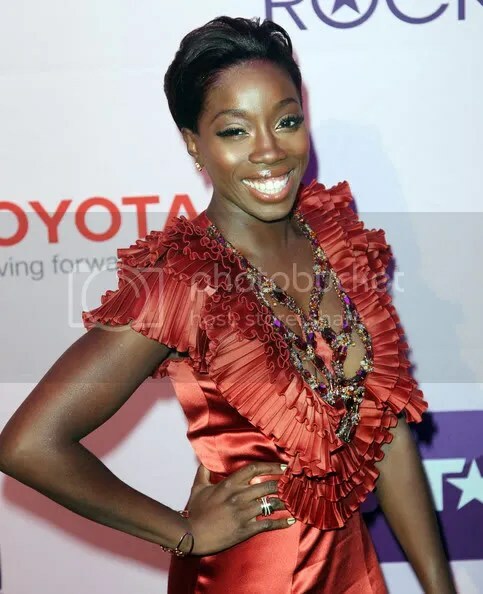 Estelle looked simply divine in this Mimi Plange “Scarred Perfection” Fall 2011 dress! 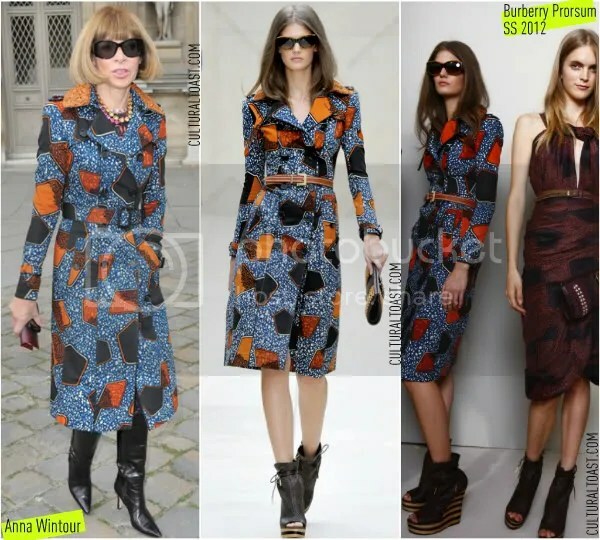 The Queen of fashion wore a stunning ankara trench coat lifted from the much-talked about Burberry SS 2011 collection. Who would thought or imagine the words Anna Wintour and ankara in sentence? Burberry made it happened! Take notice the appreciation for African fashion has heated up the mainstream media and we predict it’ll be here long after the frenzy “shimmers” down. The ever talented younger Knowles sibling has been consistent with wearing ankara and bold prints courtesy of Boxing Kitten and Opening Ceremony. 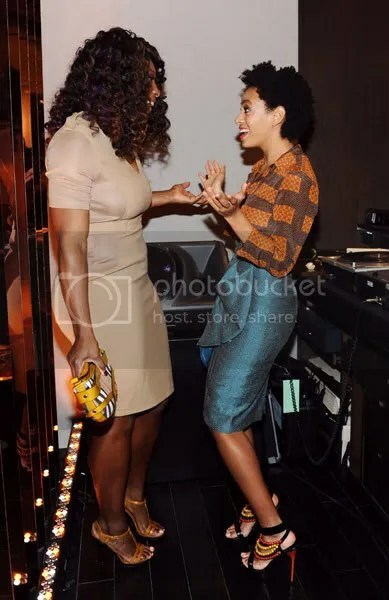 So it comes as no surprise to see Solange in another exquiste Ankara creation (Burberry Prorsum Resort 2012 shoes) at the recent Burberry Body Event. We love Solange’s high-waisted knotted, ruched skirt! 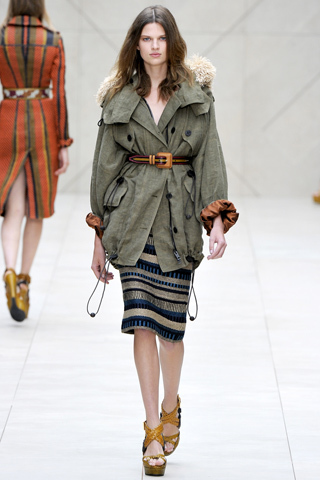 We can’t help but notice how Burberry Prorsum Resort 2012 chunky heels made another noteworthy appearance for its Spring 2012 London Fashion Week presentation as wedges! 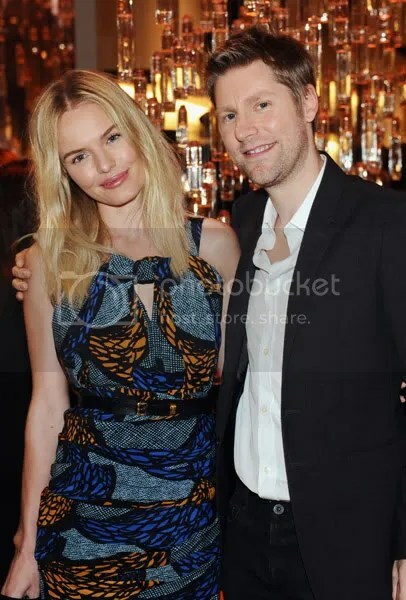 Also at the private Burberry Body bash hosted by Christopher Bailey was actress Kate Bosworth who wore a stunning ankara halter dress from the label’s Spring 2012 ready to wear collection. Do you prefer the runway look or Kate’s way? 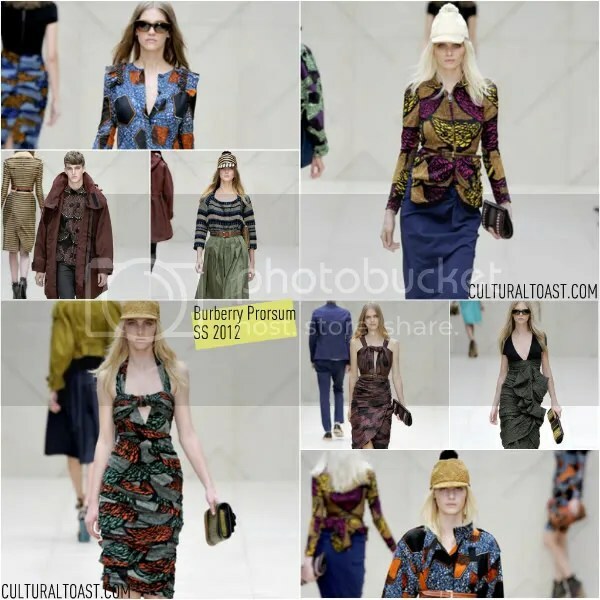 Christopher Bailey on Burberry Prorsum Womenswear SS 2012 craftsmanship: I wanted to “celebrate things that takes time to do.” In the following videos, you’ll see plenty of tailors pouring time and care to creating the Burberry Prorsum SS 2012 collection. Cultural Runway is a style feature focusing on runway looks presented at various international Fashion Week events.